In the next few pages, we present something that may be viewed by some of our readers as a controversy, perhaps one that is unnecessary. We would like readers to understand the spirit with which we are publishing the discussion that follows. A few months ago, we received an email from the author of the first review presented here. Given that the subject of his review was a series of books written by an eminent, much-decorated and admired scientist, we hesitated to print the review without sufficient consideration of its contents and therefore, sent the review to the author of the book series, as well as sending it to two other senior academic scientists. In addition, following the suggestion of the author and the two scientists, we sent copies of the books to teachers of science at the high school level, asking for their independent reviews. All this took a few months, and in the meantime, a fresh “complication” was introduced. The subject of criticism – and the author of the books – was recognized yet again with our country’s highest civilian honour. We are very aware that we run the risk of being labeled as opportunistic or iconoclastic, featuring a discussion of this kind just at this point when he is being lauded. Hence this disclaimer. One of the main authors of the series – Prof C N R Rao – is unarguably one of India’s scientific leaders. He has inspired and mentored an entire generation of thinkers and doers in science, and many of his advisees and students have gone on to take leadership roles in premier institutions in India and abroad. He has been honoured by the scientific establishment in several other countries as well. We could have acknowledged that and simply let the matter lie. And we do acknowledge that his efforts have contributed in no small measure to the growth of science in India. However, we believe that Teacher Plus should be a forum for critical and unbiased exchange of ideas and views that impact teaching and classroom practice, no matter where those ideas and views come from. The editorial team of Teacher Plus has no stake in this matter. We present the views to you as they were submitted to us. As teachers, it is important that you critically evaluate the merit of these views — and the subject matter under discussion – and make your own decisions about the books, which, really, is all we are concerned with. The damage that is caused to children by badly written texts cannot be over emphasized. An exhaustive study by Education Initiatives and the Wipro Applying Thought in Schools initiative concludes: “If a student develops a misconception in a lower class, then it is more likely to continue in higher classes too” (http://www.ei-india.com/wp-content/uploads/Misconception_Report-26-01.pdf). Young children, in particular, are very trusting of what they read in books or what the “teacher told” them. If and when they do learn to question the authoritative word, the damage is already done. The situation is particularly critical in the sciences where people high and low have been lamenting the sad state of affairs for eons. Much has been written and said about the need to shift from “rote learning” of (so-called) scientific facts to “understanding the concepts”. Missing in this debate is the fact that scientific inquiry and discovery is a process, not a set of handed down “concepts” and that this process is amenable to varied interpretation and presentation or teaching. As prefaced, the books aspire to “be useful to school children as supplementary reading material and to all others who want to learn science.” The books have been freely distributed to teachers at workshops funded by government and quasi-government organizations (http://www.nio.org/index/option/com_newsdisplay/task/view/tid/4/sid/23/nid/168) and are also posted on the IGNOU portal under the tab “Learn with Dr. C.N.R. Rao” (http://www.ignouonline.ac.in/sakshat/html/doctor.html) for self-taught students. They would appeal to parents and teachers concerned about the poor quality of textbooks to which their children are subjected by the school system. The books have been or are in the process of being translated into Hindi, Kannada, and Thai (http://www.jncasr.ac.in/cnrrao/publications.html). The relatively high price tag is quite appropriate as the books are well produced and printed in colour on high quality paper. Importantly, there are no typographical errors. This is a huge improvement over most of the school texts one finds in the market. Presumably, they have been computer set and the spelling check tool has done its job well except on one occasion where an augur is described as a tool for drilling holes, mixing dough, etc. (Part 2, p 24). It is however evident that the “grammar check” tool has been disabled in the composing software. Articles, prepositions, and conjunctions have been severely rationed making for very jarring reading. Experts are often not adept at communicating. To overcome this shortcoming, publishing houses employ editors of style, whose job is to ensure that books published by them are consistent in their use of language and smoothly and effectively transfer information from the author to the intended audience. This step seems to have been overlooked in the case of these books, thus inadvertently reinforcing a common and mistaken belief that science writing does not have to pay attention to grammar and style. The illustrations in the books also leave a lot to be desired. The authors have employed computer “clip-art” that is more commonly used to illustrate homemade invitations and announcements. They are crowded together and quite often have little relevance to the text. Almost all of them have no captions to link them to the text. Very little attempt has been made to create original drawings for the illustrations. There is consensus in the teaching community that science taught in schools (and indeed all subjects) should be rooted in the environment of the student. There is no sense in teaching children who live in lush rain forests, phenomena that can only be seen in arid deserts. Such non-experiential information can only promote rote learning. These books fail on this aspect too, as they are full of very western illustrations using, for example, ice hockey and blond people – far removed from the Indian readership indeed. All these shortcomings become insignificant when one reads the actual subject matter and scientific content of the books. Here are some representative examples. At the very beginning, the reader is taken on an imaginary journey into space (Part 1, pp 2-4). Presumably, the authors would like to demonstrate to the reader the properties of the universe as the distance from the earth increases by factors of one thousand. The journey begins at 1.6 million kilometres into space and progresses to 1.6 billion kilometres and so on. Why the multiplier 1.6 in every travelled distance? Would things be different if the journey began at 1 million kilometres and progressed to 1 billion kilometres and beyond? Did the authors originally conceive of the idea in units of miles and then convert it to kilometres? The idea of looking at the universe as distances increase by orders of magnitude is a popular way of dramatizing the nature of the universe and has been the subject of books and films including the classic Powers of Ten by Phillip Morrison and Phylis Morrison. Introducing extraneous numbers such as this detracts from the central idea of this imaginary journey. The description of the Raman effect (Part 1, p 43) seems to suggest that the Raman effect is the phenomenon of getting a Nobel Prize for working on light scattering. In a description of the states of matter (Part 3, p 26), the authors assert: “In a liquid, the atoms or molecules are loosely packed. This results in large spaces between molecules and weak forces of attraction between molecules.” The common household example of ghee or coconut oil not occupying significantly different volumes in the solid and liquid dispositions emphatically illustrates the long established fact that inter-molecular separation, and consequently, the inter-molecular forces in the solid and liquid states, are not significantly different. This fact is fundamental to condensed matter theory. Further, on the same page, the authors state, “liquids can be compressed easily”. While this statement is consistent with the above assertion of loose packing, almost any book on hydrodynamics opens with the remark that liquids are, to a high approximation, incompressible. The functioning of hydraulic machinery such as the automobile brake and presses are dependent on this important property. One of the few illustrations that appear to have been produced by the authors, the illustration of the dispersion of light by a prism (Part 1, p 43 and Part 2, p 61), is factually wrong. Some of the activities suggested by the authors can only work for the reader as “thought experiments”, such as the one that aims to demonstrate the “derivation” of Newton’s Second Law of Motion. These examples are purely representative and one can find several such errors throughout the books. Given the academic pedigree of these books, the damage that they can cause is immeasurable. It would be appropriate that they be withdrawn from publication and relegated to training workshops on textbook writing, to illustrate how a book should not be written. The reviewer is a scientist and designs and builds special purpose instruments. He is also interested in Science Education and has indigenously designed and built novel experimental apparatus for learning Physics at the secondary and higher secondary level. He can be contacted at j.richard.fernandes@gmail.com. Teacher Plus contacted Dr. CNR Rao for his response to the review of his books by Richard Fernandes. I have known Dr. Fernandes for many years. He has worked in my laboratory. I am a bit saddened by what he has written. He has completely misunderstood the purpose of the book. I have not read anything written by Dr. Fernandes till now. But he should know that anything printed can be ripped apart. Having said this, I should also mention that his review is unfair and prejudiced. This book was written many years ago and published on a private basis by getting funds from various sources. It was distributed widely in many student workshops, including in direct contact programmes with children. The National Book Trust published it about 5 years ago. There are a few mistakes that we want to correct but it has been difficult to do so because of certain logistics. The spirit and the contents of the book have not been questioned by anybody till now. I feel sad that my former associate and dear friend Dr. Fernandes has questioned the very idealism with which we wrote this book. To say that the book presents mistakes and little else is far from the truth. I have written a large number of books and papers, and constantly review both research papers and books. I have tried to be as fair as possible to their authors. I feel that a book review should not forget the purpose and the use of the publication. In this context, Dr. Fernandes’ review is unwarranted and inconsiderate. 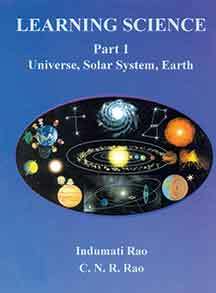 Universe, Solar System, Earth is Part 1 of a book series entitled “Learning Science”. The focus of this part is the universe and its constituent elements. The other parts deal with several other facets of physics, chemistry, and biology. The chapters start with a broad perspective of the universe at large, moving to the narrower solar system domain, finally settling in on planet earth. This flow is cohesive and allows the reader to appreciate the bigger picture while still being able to look at the finer details. The initial sections about the universe are very descriptively written. They cover galaxies, stars, and the planets with a moderate level of depth. Perusing these chapters gives the feel of being on a guided tour on a spaceship with valuable, interesting information provided along the way. The focus then shifts to the solar system. Right from the story of our solar system to the information about the Sun, planets and their moons, a lot of relevant and interesting facts have been detailed. This book is written keeping the inquisitiveness of children in mind. It addresses common questions like, “If the earth is round then how are we able to stand erect and not fall off?” There are activities that the child can do to determine why we perceive the earth to be flat if it is in fact round. This helps to reinforce concepts. There are chronological listings from the various mathematicians, astronomers, and space voyages to show how they arrived at the current shape of the earth. The work done by Eratosthenes to calculate the circumference of the earth could have been more clearly illustrated to bring out the idea. Earth’s gravity and its uniqueness are well covered at a level that a child in middle school can understand with ease. The description about the interior of the earth, how rocks are formed and how that leads to the formation of soil is well supplemented with good colourful illustrations. The earth’s interior is generally covered in a geography book in great detail, but this book approaches the topic from a different angle. The concept that “The evolution of the earth is the result of the internal and external heat engines simultaneously driving the earth” is a very interesting view point. The role of internal heat in the buildup of energy, continental drift, and the origin of mountains, is brought out effectively. This offers a different perspective to understand why mountains keep growing, or why there are changes in the weather and climate, or about the water cycle. The origin of seismic waves and tsunamis is explained in simple terms as well. The earth fever chart is something of interest to an adult perhaps, but without relevant day to day examples, the data could be lost on children. The section on minerals is interestingly captured with the classification of minerals made simpler keeping the young reader in mind. Carbon dating could have been explained with greater clarity. At the end, the reader is still left wondering why carbon content begins to decrease as soon as the plant or animal dies, and how carbon dating actually helps determine the age of rocks. The description about the types of rocks, how they are formed, what their significance is and how they form the soil layer are well interspersed with colourful templates. The last part of the book is about the motion of the earth and how seasons are formed. The underlying reasons behind why the two hemispheres experience diverse weather patterns have been elaborated well. Eclipses, the different phases of the moon, the formation of high and low tides have not been explained however. The authors have appropriately mentioned that this book is for “Those people who want to understand Science and partake in the excitement of this experience.” On the whole the book is good supplementary reading material that is relevant to a young child, as well as, for parents if they want to explain difficult concepts to their children with ease. The colour templates are very clear and of good quality. The paper is glossy and thick. The print is big enough for the child to read easily. 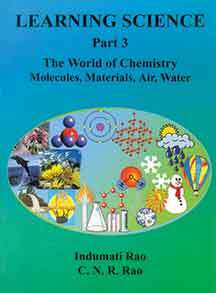 The world of chemistry: Molecules, Materials, Air, Water starts with the question “Why should we learn chemistry”? The authors have shown through this book that chemistry is the glue that binds everything around us right from the universe and the stars to how the atoms and molecules function. The author gives instances starting from ancient times about how chemistry is widely studied by alchemists in search of gold. Explaining the atom is always a challenge given that the subatomic particles and their significance have to be detailed, while still making it simple for the child to visualize these particles. The authors have almost been successful in meeting this challenge with the exception of clarifying the concepts of atomic mass and atomic weight. Carbon is an element that plays a vital role in our daily lives. The chapter on carbon is well written and is sure to get the interest of the child with beautiful illustrations. The element has been elaborately covered starting from allotropes, to oxides of carbon, hydrocarbon, an insight into carbon fuels, finally the natural polymers. Though all the relevant facts about carbon are adequately covered, a thread of connectivity across them is lacking. Also, some repetitions could have been avoided and concepts explained with a bit more clarity. The characteristics of the elements, mixtures, and compounds are brought out well elaborating the methods of separation of mixtures. Valency and atomicity are explained well at a basic level. The hardness of water is a very useful supplementary chapter, given that this topic is not generally part of the syllabus. This has been covered fairly well. The concept of electrolysis of water is difficult to comprehend without an explanation about the principle of electrolysis. The role of catalysts is also worth mentioning. While properties of acids and bases are listed, relevant concepts such as neutralization reactions, formation of hydrogen ions in water by acids, dehydration, and indicators are missing. The preparation and properties of gases like hydrogen and oxygen is described well. The description about carbon dioxide and carbon monoxide could have been under carbon compounds under fuel gases. Combustion is an interesting chapter covering all aspects of fire, burning, and fire extinguishers. The anatomy of fire is explained in an interesting way, however, the difference between combustion, burning, and respiration could have been explained to complete the picture. The information on hydrocarbons could have been introduced later along with other organic compounds. The hydrocarbons mentioned may not be familiar to a child in middle school. Also it is not clearly explained why hydrocarbons are called energy compounds. If the formation of natural gas and petroleum in nature is explained then the child may understand how petroleum as well as natural gas happen to be found at the same place and why this is a mixture of so many hydrocarbons. A simple illustration of the fractionating column could have been introduced to help visualization and understanding. An explanation about LPG is missing. The section on polymers contains numerous examples from day to day life. A small mention about the unique property of the carbon atom to form a polymer would help the child understand why carbon forms the skeleton in these polymers. This section could have been linked to the section on manmade materials where most of them are synthetic polymers. The chapter elaborating the methods of extraction of metals is slightly more complex for a middle school student without the explanation of the technical terms. The chapter on manmade materials on the other hand, is written simply enough for the child to read and understand. The chemical fertilisers section of the chapter could have been made simpler. The chapter on air is written in an interesting way with several activities included. Similarly, the chapter on water is written in a holistic way. Right from water cycles to the special properties of water, care has been taken to weave the facts in a beautiful pattern. Both the air and water chapters are the best written chapters complete with weather water cycles, replete with discussions about the protection of environment, pollution of air and water, and purification of drinking water. These topics should definitely be discussed to create awareness in children. In the preface the authors state the purpose of this book. “Children and adults alike have to know the rudiments of science and must be able to use the language of science wherever necessary.” The book definitely has achieved that purpose. The contents are well drawn up. It has good illustrations. The print is easily readable by the child. The authors have attempted to give valuable information in a simple way so that even non science people can understand. The book has been successful in attracting the attention of the reader, piquing the readers interest and curiosity. The authors have managed to pack a lot of content into a limited number of pages. Most of the chapters are well laid out and coherent. Some terms and explanations are pitched at a level higher than what a middle school child can absorb. In those cases, the teachers/adult’s role is inevitable to help the child understand them further. Barring a few missed topics and confusion in one or two chapters, this book serves the purpose of a good supplementary reading for a young child, as well as for an adult who wants to understand science. The authors have made several statements in their preface. Four of them have been chosen to examine whether the materials in the book adequately reflect/substantiate their expectations. This is an excellent objective, but one which has not been carefully thought about in the choice of language used throughout the book. For instance, the authors’ suggestion, ‘poke at the object to find out if it reacts (response to stimuli)’or ‘Criteria of living things – Living things have heredity’ are examples that reflect the lack of scientific rigor. This book is an assemblage of snippets of data. It would have helped had these bits and pieces of text been strung together well to facilitate application in daily life. Supplementary reading material must add to the regular text/materials used in class by providing sufficient explanations, interesting presentations, thought-provoking questions, and clear and well labelled illustrations. It needs to be absorbing, challenging and provide something that is not found in a regular biology textbook to attract the attention of intelligent teachers. A struggling teacher would turn to such materials, only if organized explanations were made available. An educator would hesitate to recommend this as a supplementary material because of linguistic errors, incoherent organization and descriptions, emphasis on data over concepts and outdated information. Protozoa is described as an animal. Fungi are given as microorganisms and sandwiched between descriptions of plants; the image of body organs arranged (page 68) inside the human body has all the classical errors, for e.g. it shows the liver extending into the thoracic cavity. On page 101 the description and the flow chart on the nervous system is misleading and lacking in important concepts. The description of sensory and motor pathways without the inclusion of the spinal cord is a shocking omission. Every single chapter has errors or important omissions. The chapters contain whatever has caught the fancy of the authors and so are completely lacking in coherence. Analogies when used need to be carefully thought through; for example, a city is not a suitable analogy for the vertebrate body. 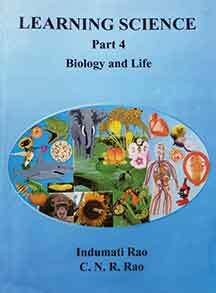 It will be difficult to excite a reader when all aspects of biology that a student learns over a period of three to four years are crammed into 118 pages. The book is an equivalent of modern day SMS. The authors jump from one topic to another so quickly that a reader will likely remain confused or bored. Evolution of life on earth is less about evolution and more about bacteria; implies that fossils are the only way of learning about evolution and deals with fossil bacteria as an example. What is reproduction or harmful and beneficial effects of bacteria (all given in bullet points) doing in a chapter on evolution of life on earth? Similarly, in the middle of classification of plants, there is a paragraph on insects, but under classification of animals only protozoa and sponges are mentioned and then a jump to vertebrates. If we want excellence in science education then we need to have biological concepts as the overarching theme of our books. This is missing from this book. Quality, quantity and layout of the images need to be looked into. We cannot compete with the best in the international arena if the materials we produce for students and adults continue to remain listless and ordinary.